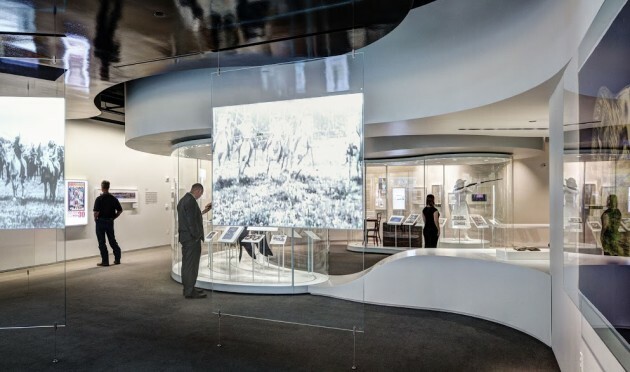 Los Angeles, CA, USA (December 16, 2015) – Electrosonic recently provided audio-visual equipment and integration services for the National Cowgirl Museum and Hall of Fame when it remodeled its first-floor gallery and added a stunning interactive mobile in the Grand Rotunda. The additions are part of a two-phase renovation of the museum’s galleries and public spaces. Located in Fort Worth, Texas, the National Cowgirl Museum and Hall of Fame is the only museum in the world dedicated to honoring women of the American West, past and present. Its archives house more than 4,000 artifacts and information about more than 750 remarkable women; the Hall of Fame has 220 honorees, including author Laura Ingalls Wilder, Hollywood’s Dale Evans, and Lewis and Clark’s guide Sacagawea. The 33,000 square-foot museum is part of the Will Rogers Memorial Complex in the heart of the city’s cultural district. The museum’s new signature piece is an interactive mobile, a hanging sculpture held in equilibrium by rods and weighted objects that balance each other. The mobile, suspended in the Grand Rotunda’s towering atrium, grabs the attention of visitors entering the museum and is an engaging focal point for the formal dinners and fundraisers held in the space. The mobile includes rotating graphic panels and a dozen rotating projection screens, all hanging from rods suspended from the ceiling. Electrosonic furnished BrightSign players that feed NEC LED projectors, which display video clips onto the 12 projected screens. The projectors are also part of the mobile itself; they are mounted on their sides in double-sided casings. The mobile’s video content can be changed to support special events taking place in the Grand Rotunda. The new permanent first-floor gallery highlights cowgirls in Wild West shows and the legendary sharpshooter, Annie Oakley. Four small and one large Pepper’s ghost exhibits are triggered by motion detectors buried in the walls. Visitors approach a viewport-style hole where they can view the special effects formed by pairs of 20-inch video monitors and half-silvered mirrors. A life-size Pepper’s ghost of Annie Oakley was created with a ceiling-mounted Panasonic projector. Electrosonic also provided five double-sided hanging glass screens, each illuminated by a Panasonic projector and a BrightSign player. Five more BrightSign players feed 48-inch Samsung monitors hung in portrait orientation. In addition, five wall-mounted interactives are driven by Dell computers and feature Elo Touch Solutions 32” touchscreens. A photo booth, where visitors can pose with historical images and print or email themselves a picture, is outfitted with a Dell computer, a Point Grey Flea camera, a small Elo Touch Solutions touchscreen and monitors. Software was supplied by Blue Yeti. Electrosonic programmed the Crestron system that controls a total of 31 BrightSign players, an array of projectors and monitors throughout the gallery.